I decided to try something different today and put in next to the river street boat ramp at a very late 7am. 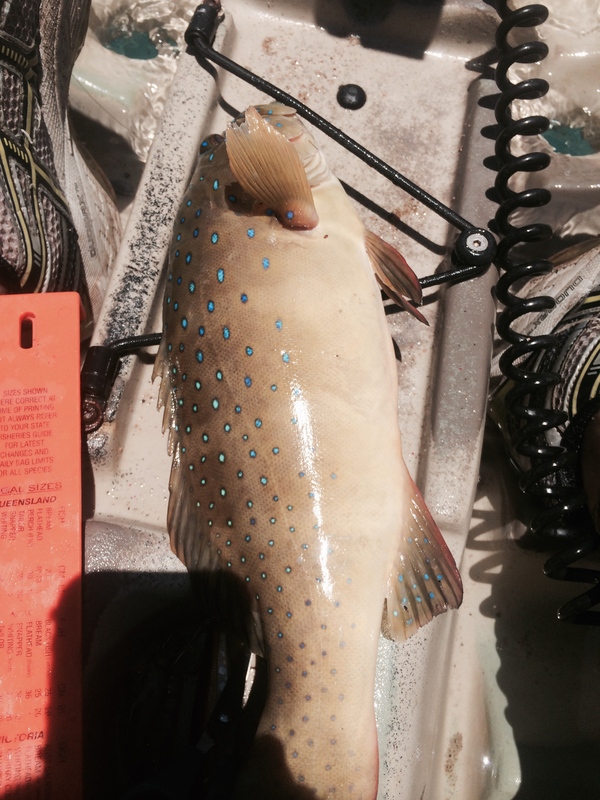 I paddled out to the mouth ignoring many of my usual fish catching spots to maybe tangle with a pelagic or two. In doing so I arrived way too early for the incoming tide and my trolling did not receive any piscatorial interest. I am so glad that I was premature in my arrival as when I rounded the last point of the rock wall I noticed a ridge line of oyster rocks leading into shallow sand bars. 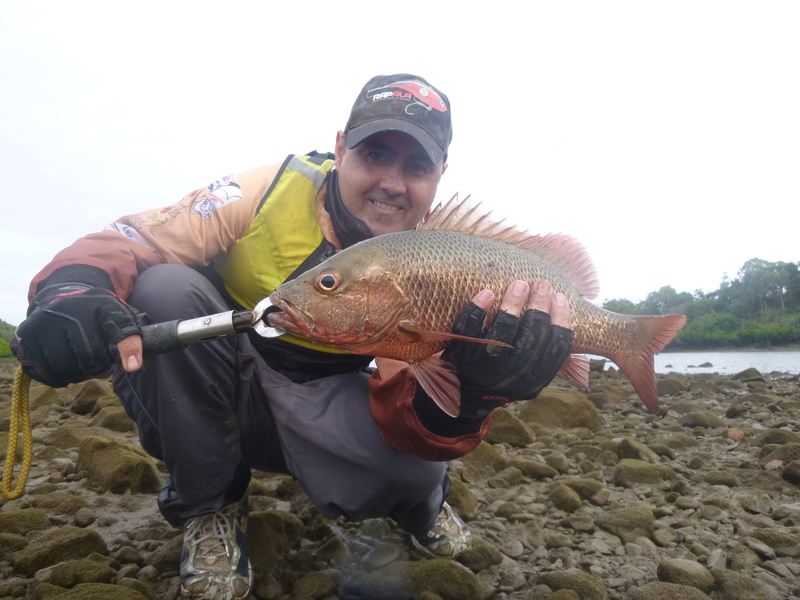 As I investigated further I could see two tail fins sticking out of the water above the rocks, quickly I tied a surface lure on my 6lb set up, these fish did not look too big and I was sure they were small GT’s. 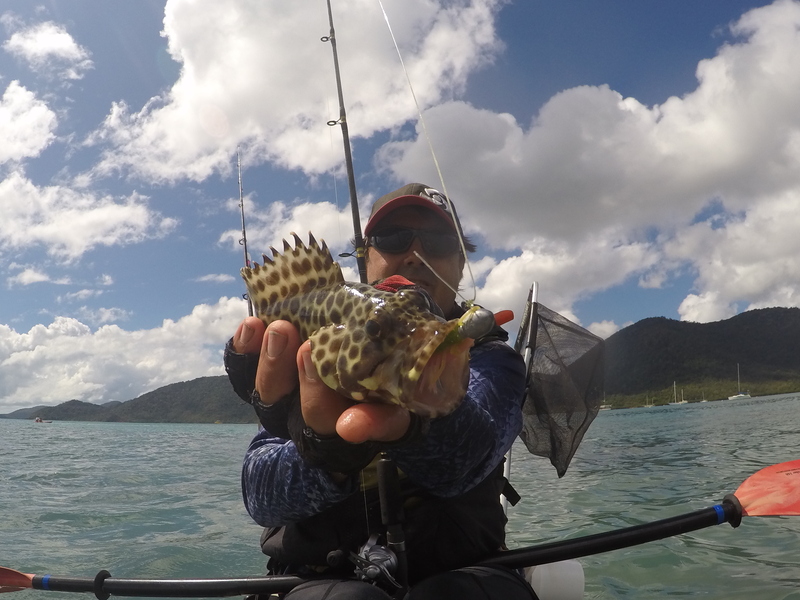 With an ultra long cast I landed the lure a few metres behind them and they did not budge, I slowly worked the lure towards them and as the lure entered their strike zone I sped up the retrieve. 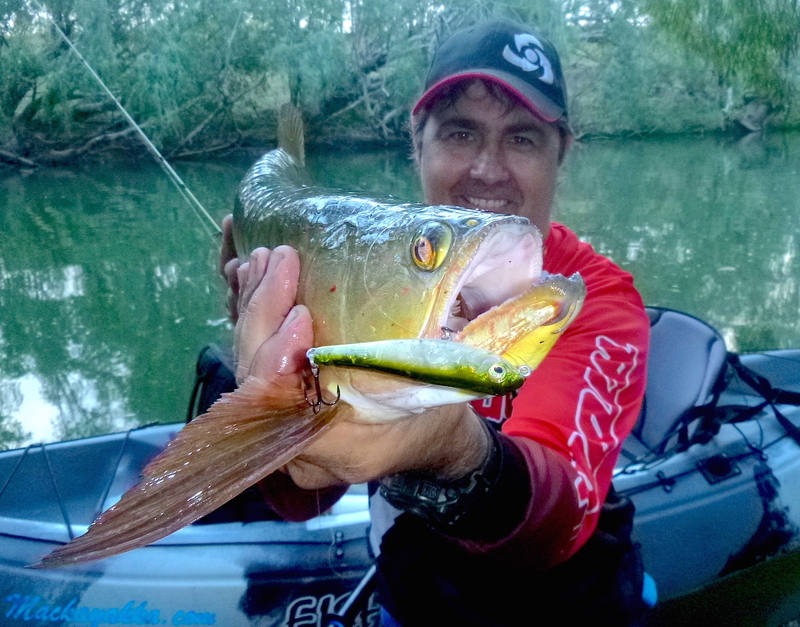 There is nothing more exciting in angling than watching four bow waves chase your lure in shallow water. 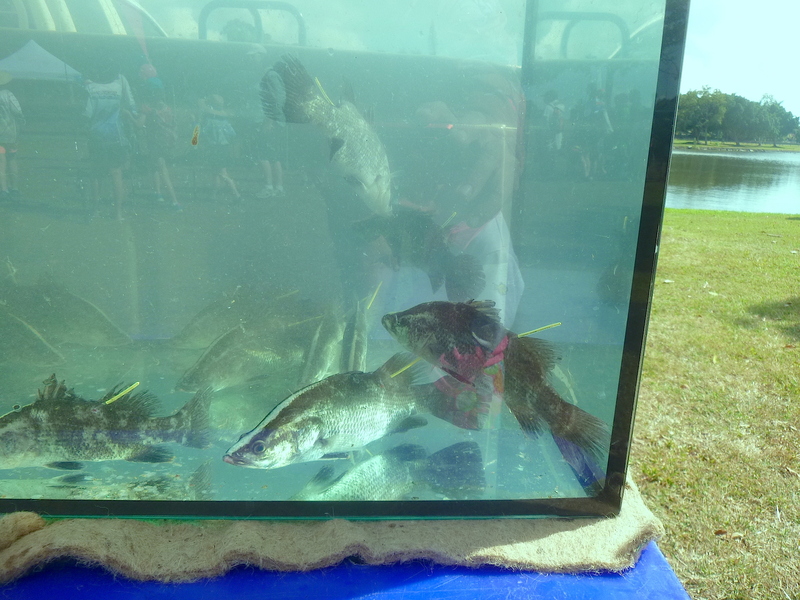 These fish wanted it! Wham! A good strike and hookup! 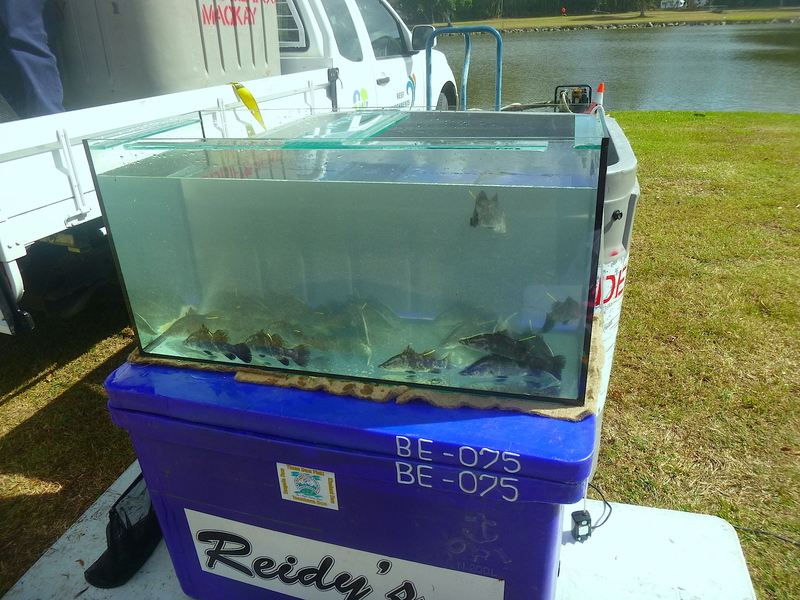 This fish went berserk with criss crossing manueveurs over the oyster rocks. 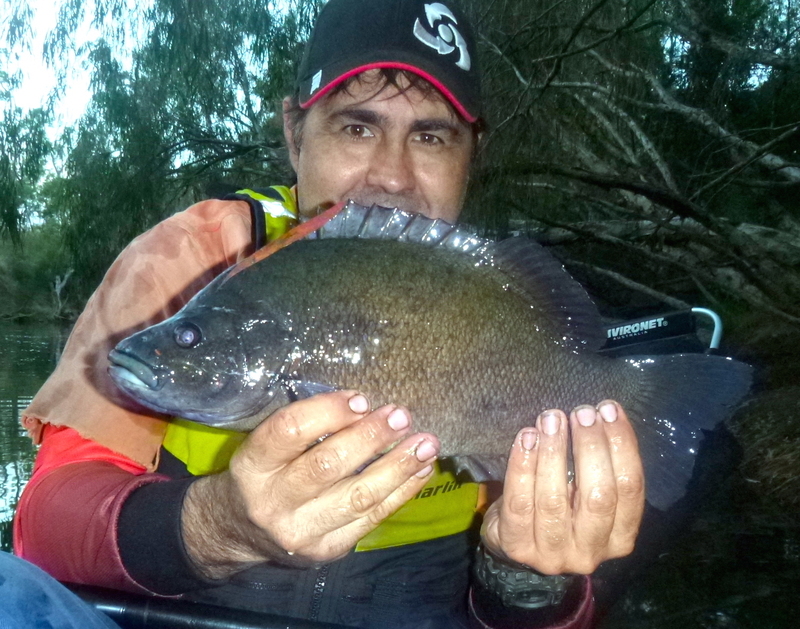 The 6lb Nugsy braid did the job nicely and I had on board a 32 cm bream! 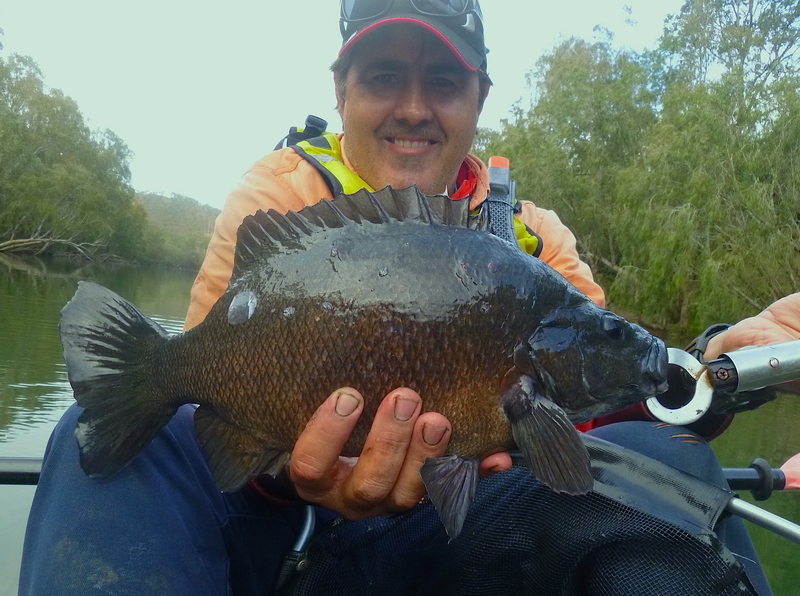 A memorable surface bream PB for me and I was stoked. 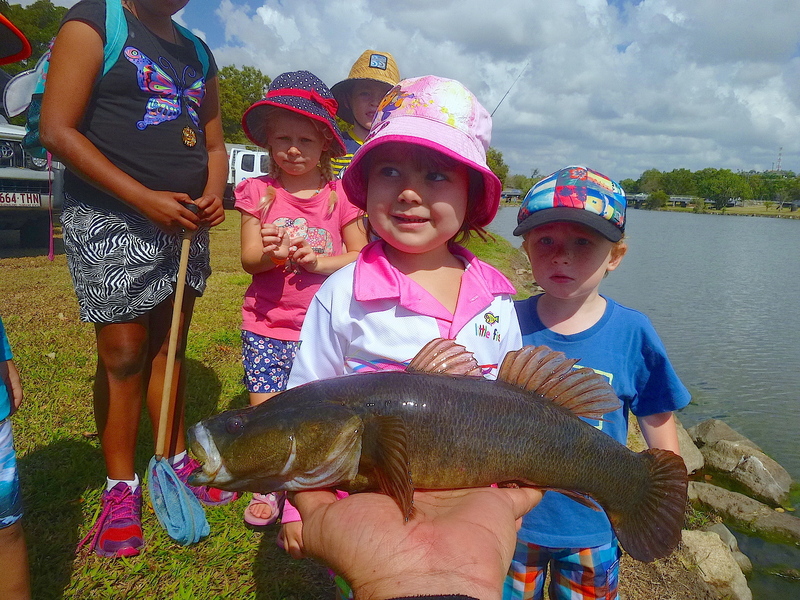 I cast again in the same direction and a shorter cast landed right where I sighted the fish originally….. a few twitches and another 27cm model was in the net. 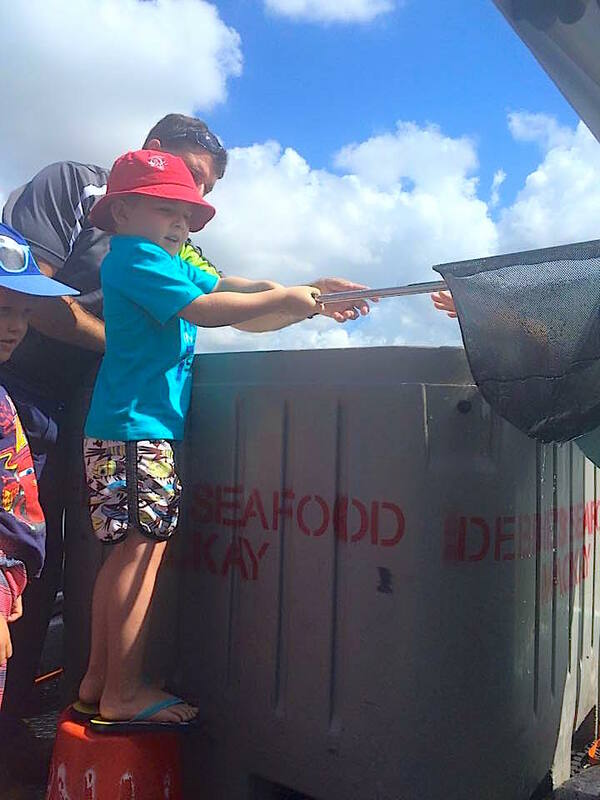 As the tide was on its way in I saw some birds working a small patch of bait and paddled over for a look there was a school of queenfish feeding and I managed a few around the 50 to 55cm mark but no larger ones were caught for the day. Nice morning though! Launched my kayak at the Pioneer River boat ramp Sunday morning after having a fishing trip cancelled the night before due to a thunderstorm. It was a beautiful morning on the water and as I made my way out to the mouth of the river I came across a bait school of large herring being tormented by some as yet unknown predators. I had on an Atomic Prong prawn imitation so threw it in amongst the school, let it sink for a few seconds then on a slow roll retrieve it was hit hard by a 50cm GT that put up a great fight on 6lb braid, what a great start to the day! The next couple of hours were spent playing with some medium sized estuary cod along the rock wall with about 5 fish caught and released. Its been a while since I had been out in the yak and as usual I had a blast. 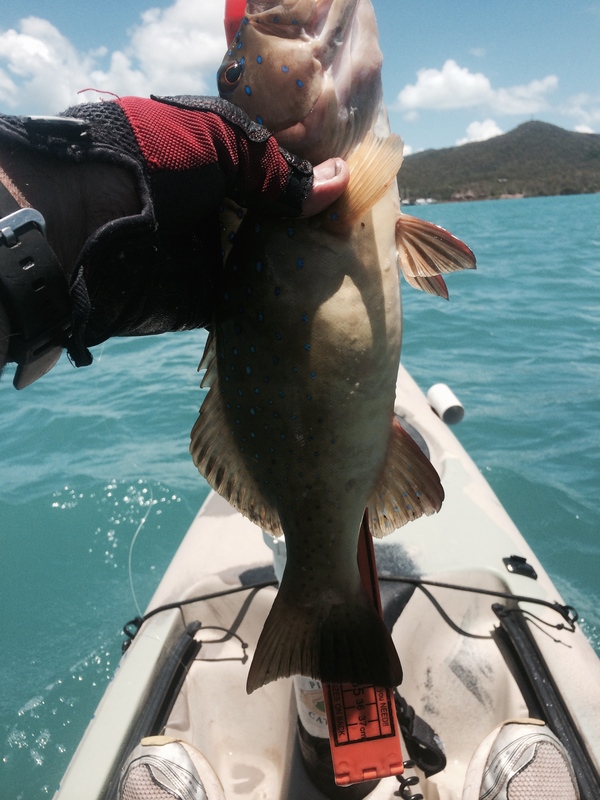 Catching a few Cod and GT’s in Mackay’s Pioneer River is one of my favourite ways to spend a Sunday morning. Friday night, 11pm and I can’t sleep, what else to do but load up the yak for an impromptu barra session on Kinchant dam. A 40 minute drive and I was on the water just after midnight. The moon was nearly full and shone brightly as I pushed off into the glassy vastness that is Kinchant dam. Immediately the telltale boofs were all around with lots of surface action in the shallows. It didn’t take long for my unweighted SP frog to be engulfed by a good sized bucket mouth in amongst the lily pads. 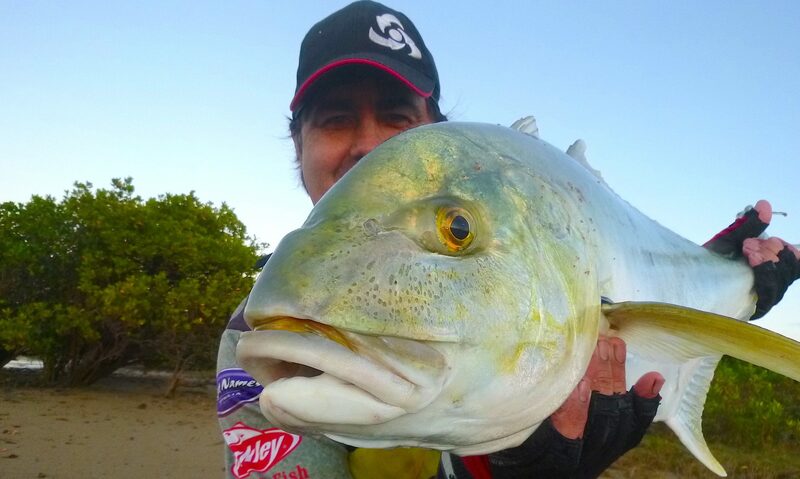 Now I hear a lot of people say that freshy Barra don’t fight as hard as salties, all I can say is that this fish never got that memo taking me into the weed then out into open water where he went aerial against the backdrop of the moonlit night. The fight was intense as he tried everything to rid himself of that frog but after two missed net attempts I slid him onto the yak. The 84cm fish is by no means a monster for these parts and no PB but I was feeling grateful for my insomnia none the less. The rest of the night yielded no more fish although two brief hookups and countless boofs and follows behind my lures ensured that I will be burning the midnight oil at Kinchant again very soon. I was feeling anything but confident but I had a plan for this supposedly no fish producing wind. 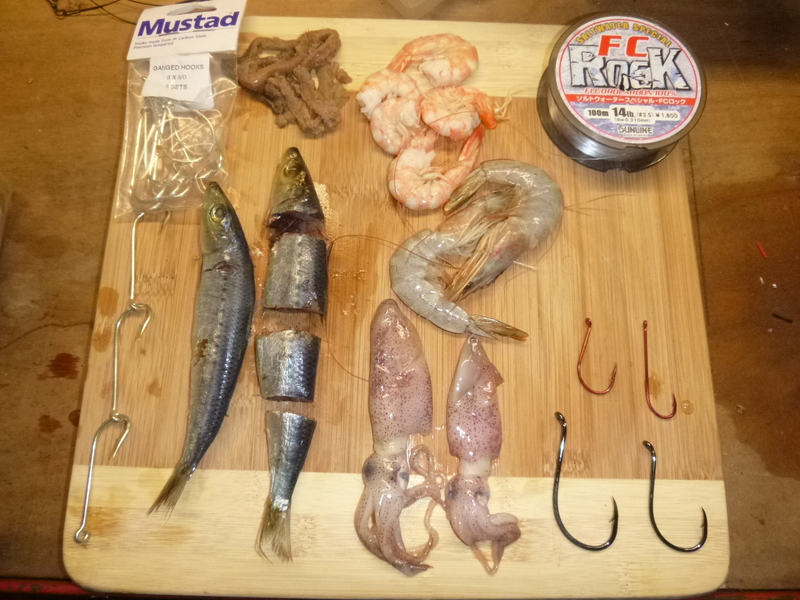 The previous night I had cut up a smorgasbord of bait to use on this session, so armed with prawns, sand worms, pilchards and squid along with a few soft plastics I set off with no real target species in mind. I baited up my Shimano Caenan reel spooled with 30lb braid and 20lb leader matched with a silstar power tip pro rod. 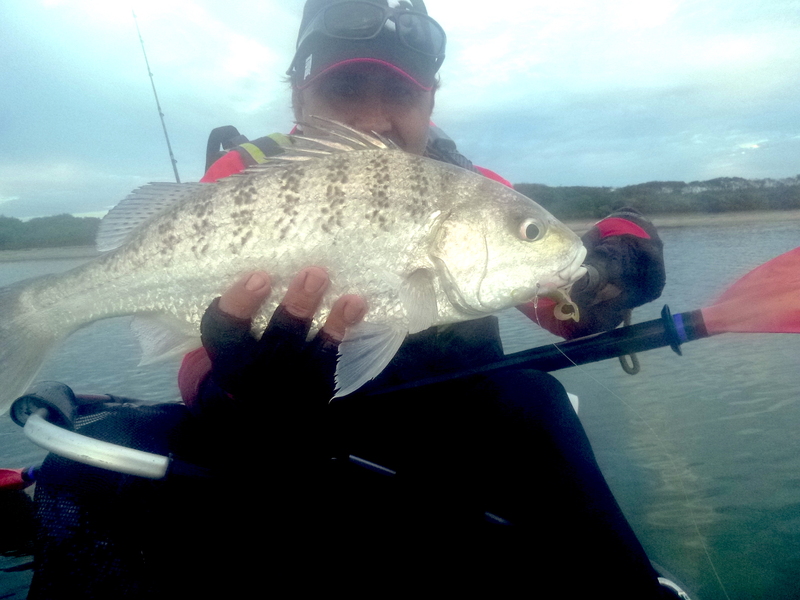 My bait of choice was a whole pilchard presented on 3 gang hooks floated out the back of the yak while I made my way to my first spot. 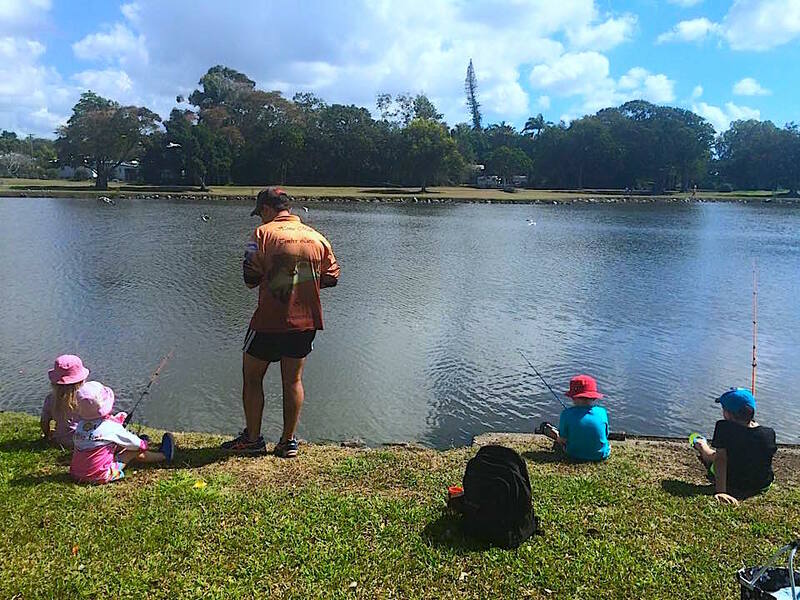 Within 50 metres of the boat ramp line began zinging off the Caenan at a great rate as I battled to get the rod out of the holder. 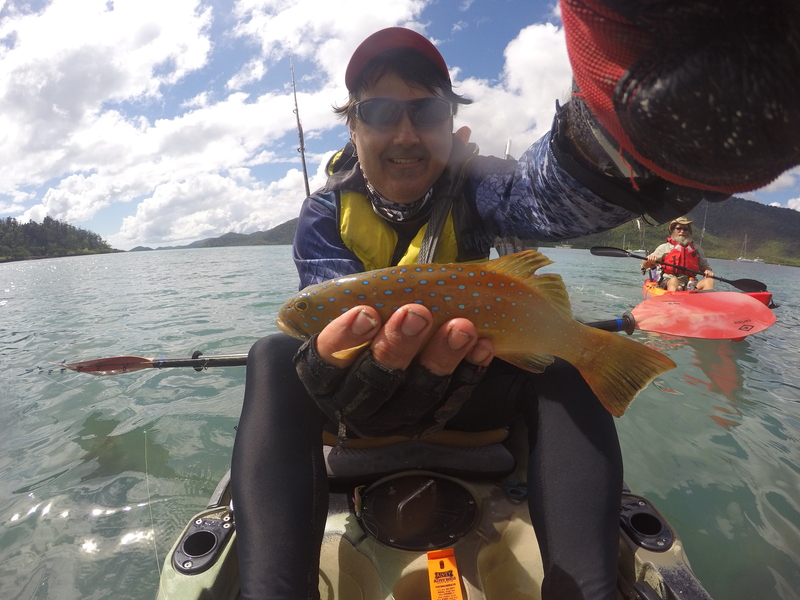 I turned the yak to face the fish that was travelling rapidly in the other direction and cranked up the drag. After a few minutes of a most torrid tussle the fish started swimming in large circles directly below the yak giving away its identity. 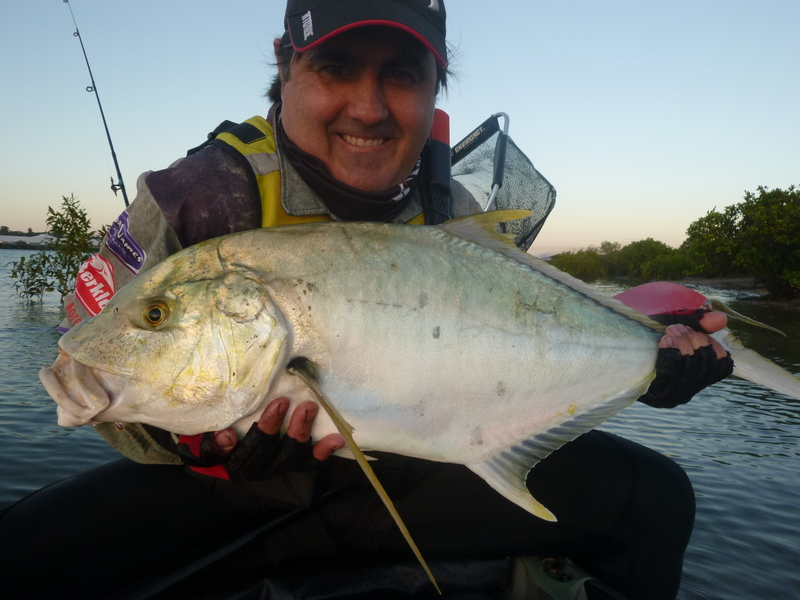 With the first colour showing I instantly recognised the golden hue of a good sized golden trevally, now these fish do grow quite a bit larger than this 85cm speciman but it is quite a large one for this estuary system. The next hour produced only a small cod and a flathead so although the fishing was definitely a bit tough as my early morning advisor predicted I still managed to land a personal best and to me thats gold! 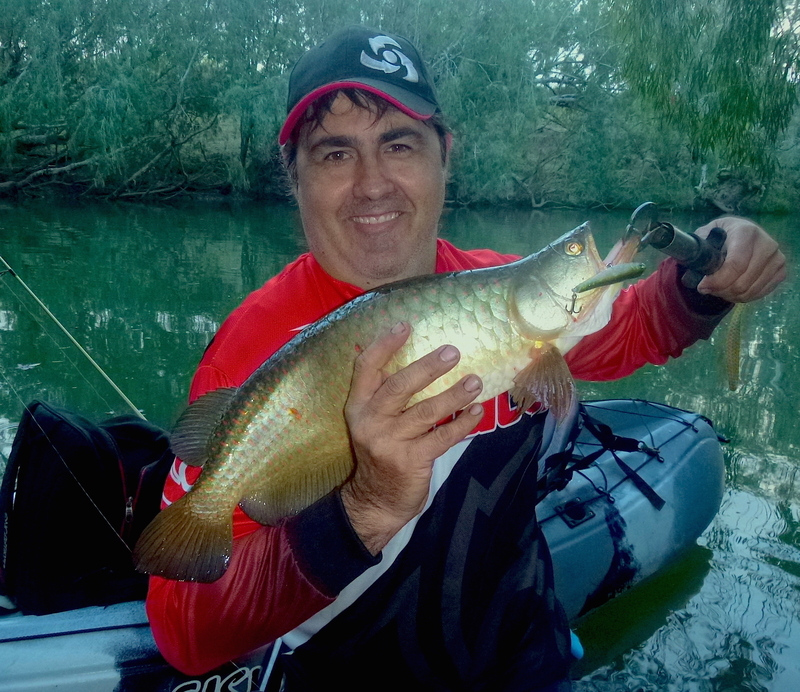 It was an early Monday morning start as I took advantage of a rostered day off to have a Pioneer River flick session with my old mate Steve Bugeja. 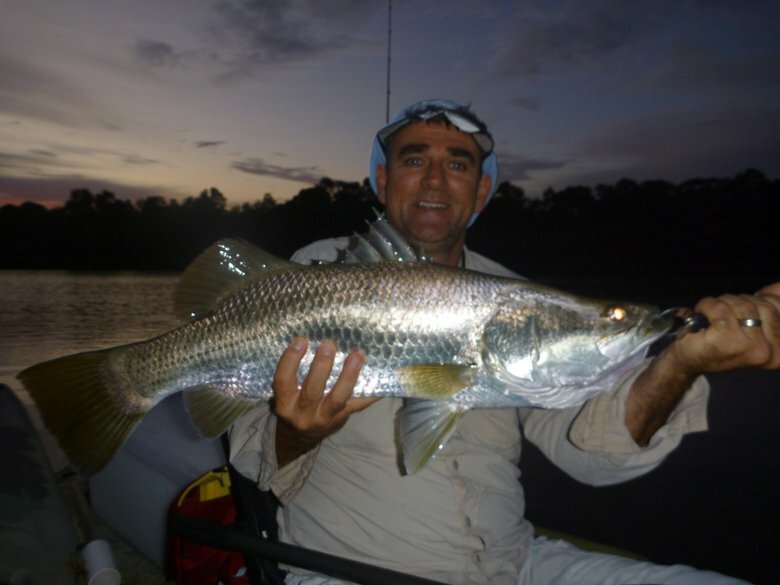 Steve is a legend of the Mackay kayak angling fraternity and what he doesn’t know about the subject isn’t worth knowing. 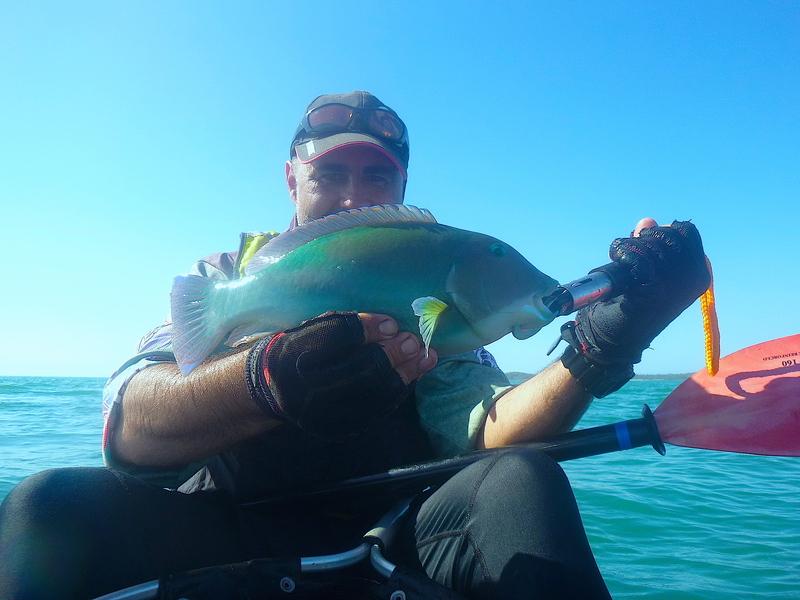 He put me onto my first kayak fish nearly five years ago and I have been lucky enough to witness some of his epic captures including this personal best 50cm mangrove jack. After a short time negotiating a fairly rough launch area we slid our yaks into the glassy river in the half light heading downstream in search of anything willing to take a lure. 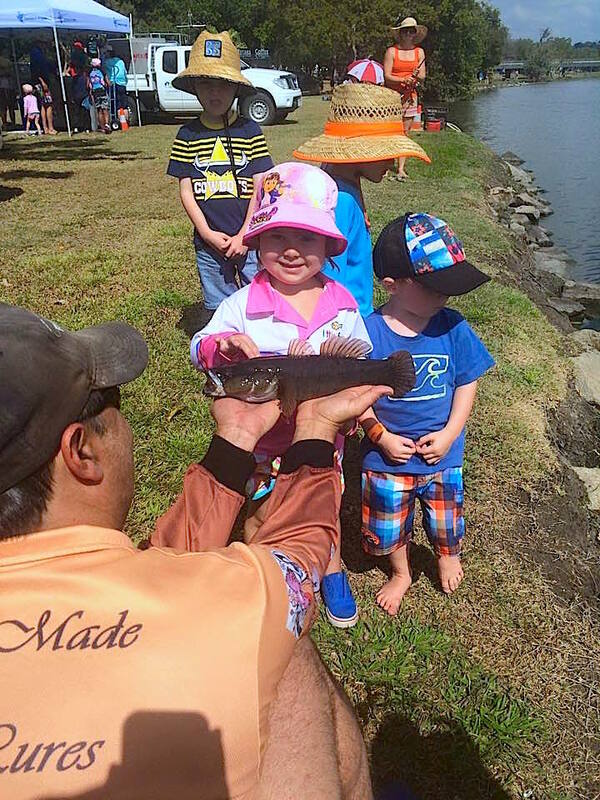 With large mullet jumping from the shallows as we headed for deeper water there seemed to be plenty of surface action and our hopes were high. Steve settled in drifting the sand bars trying his best to tempt a flathead to take his 3″ Berkley powerbait minnow in clear while I targeted a deeper section adjacent to a rock wall with a 3″ Atomic prong whilst floating a Pilchard on gang hooks out the back. 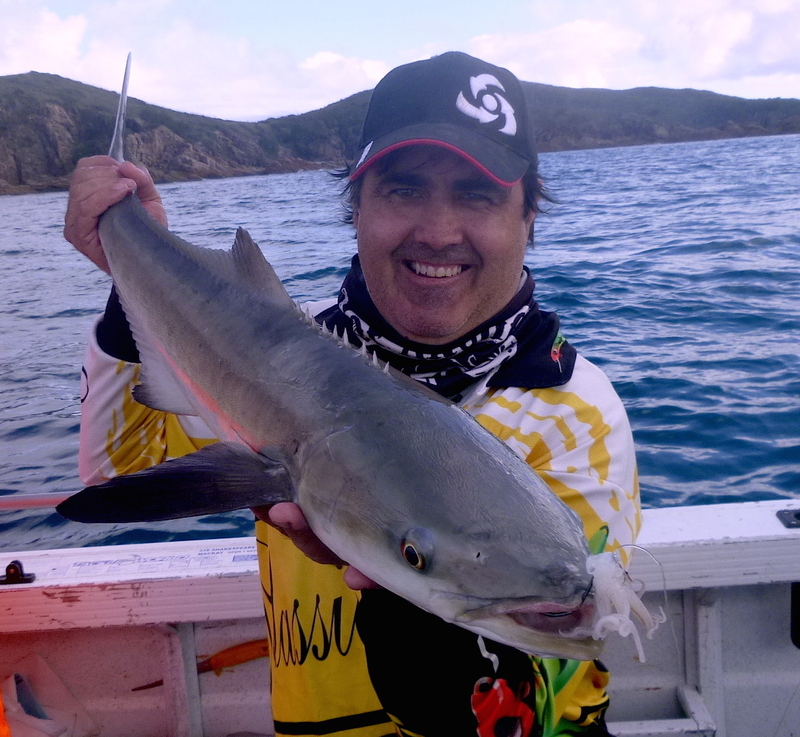 I was struggling with my pilchard line being solidly connected to the bottom when I heard a commotion coming from the direction of Steve. After ridding myself of the offending snag I paddled over just in time to see him bringing a large fish over the side of his brand new 2015 Hobie Outback. 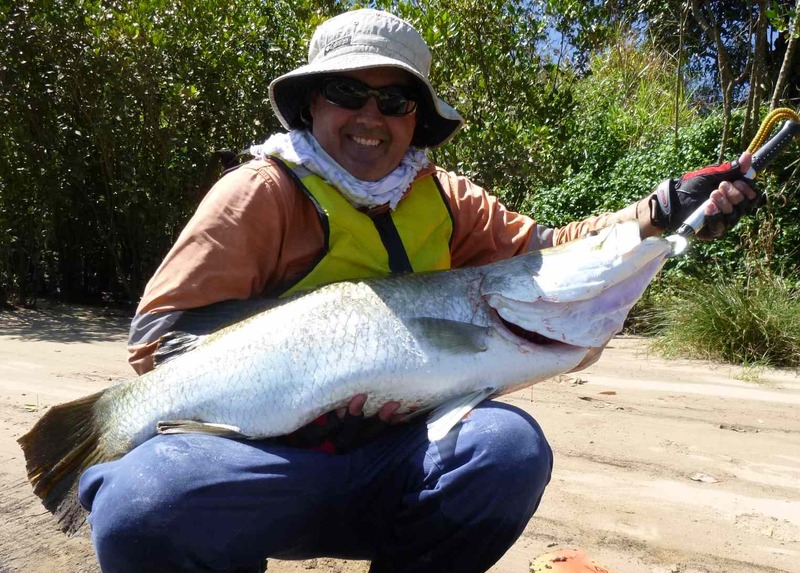 A 70cm winter barramundi had taken a liking to the most minute of baits in very shallow water, again the master showing the apprentice how it’s done. The first fish for his new yak and another personal best and the sun was not even up! I then realised maybe I was fishing too deep and proceeded to follow Steves lead and fish the sand banks, gratefully declining his offer of lending me one of his powerbaits. 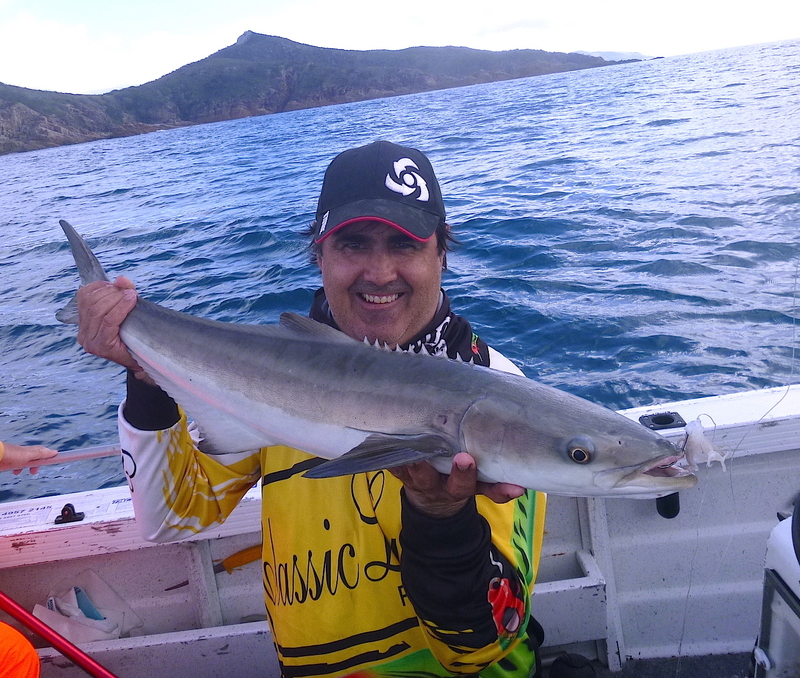 I stuck with the Atomic prong and was rewarded with a feisty strike and run but was disappointed in the end result as a 35cm Barracuda came on board. These fish have nasty teeth and a quick look at my leader confirmed that it required replacing so after a quick cut and re-tie I continued peppering the shallows. 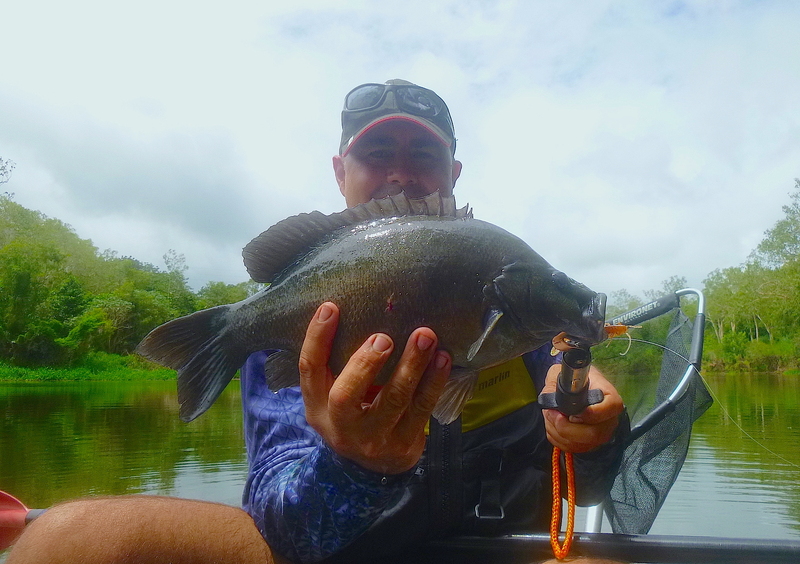 In a short while a solid strike peeled the 6lb line off my Shimano Aernos with ease and after a very entertaining fight one of my favourite target species the Grunter or Barred Javelin fish was in the yak. 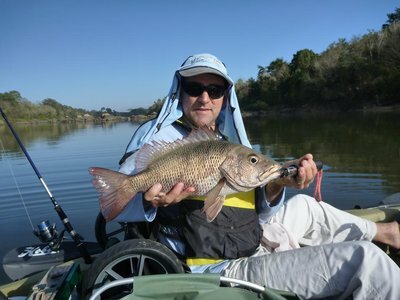 At 50cm this fish was a personal best for me, although Steves barra was a little bit more spectacular a PB is a PB and i was stoked! So the lessons learned today on winter fishing tactics, when the temperature cools fish shallower with smaller baits and you just may be rewarded with some quality fish. Oh and it does help to take a legend with you! It was a great Monday morning out on the river made all the more enjoyable by watching the heavy procession of cars travelling to work over the bridge with their occupants looking down longingly at two very lucky mates on kayaks enjoying the best a Mackay winter has to offer.